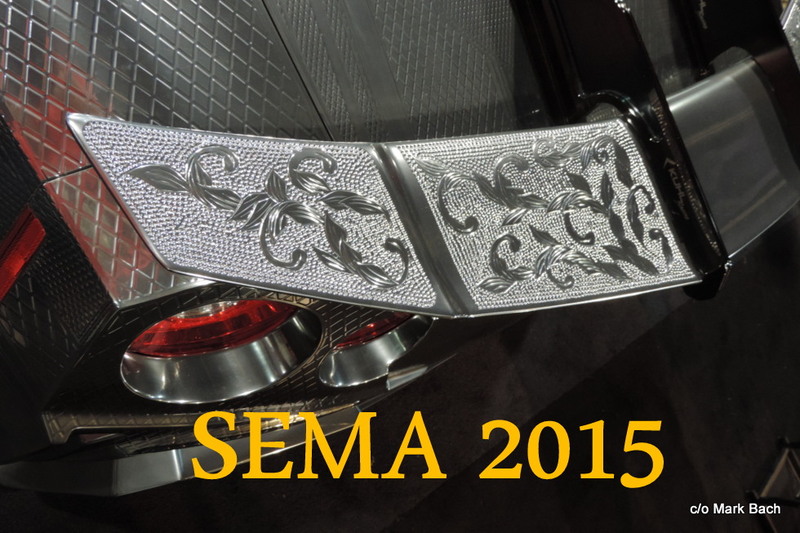 The SEMA Show concluded last week in Las Vegas, Nevada and it is hard to describe to someone that has never attended. Combine 2.5 million square feet of space devoted to cars and trucks and everything that makes them run with over 2,400 exhibitors and nearly 150,000 attendees. There were 3,000 products alone in the New Products Showcase! 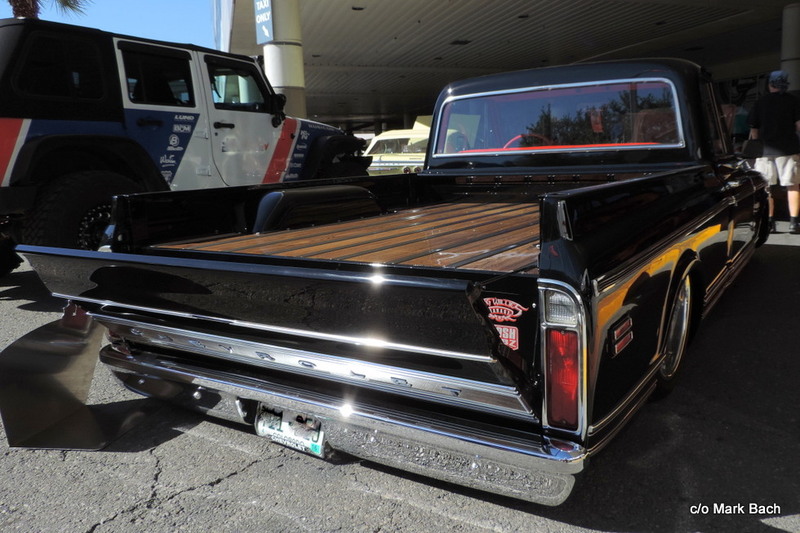 Over 1,500 vehicles were on display, both inside and out. 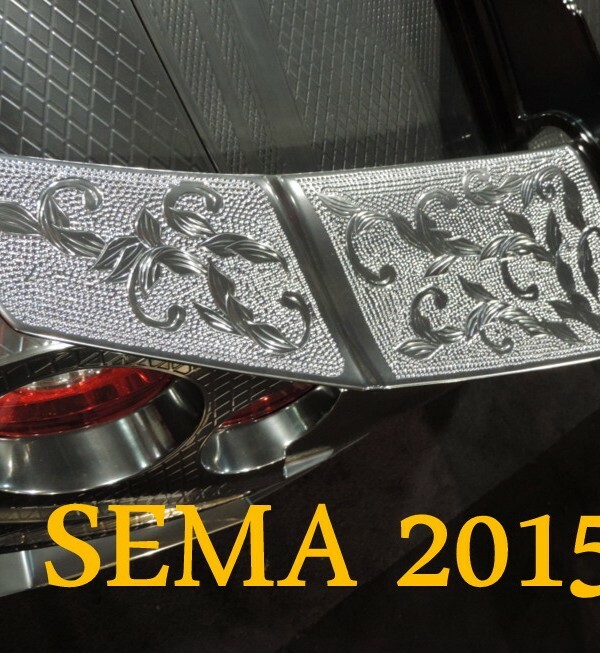 And SEMA (Specialty Equipment Market Association) reported record breaking attendance. Trust me; if it was made for a car, it was there on display. Car manufacturers bring out production cars, new models and concept cars to ogle. 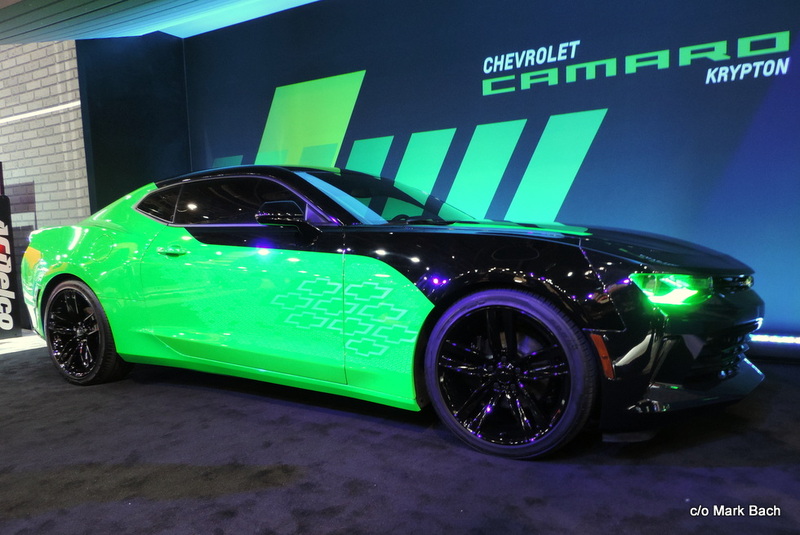 Perhaps none drew more looks and puzzled expressions that the Krypton Green Camaro. This Camaro in RS trim featured paint, yes paint, which was luminescent. So this “bow tie” glowed along the front quarter panels that pulsed on and off with green bow ties for an awesome $80,000 paint job. Many cars are so over the top it makes you scratch your head. One feature was a tubular construction that had been previously at the Burning Man event. Apparently this five-seater wasn’t yet fully operational, but it drew many a puzzled look at the outdoor display. Rat rods made quite a splash and for some it is hard to decide if the builders just gave up or intentionally wanted the rats to look that way. 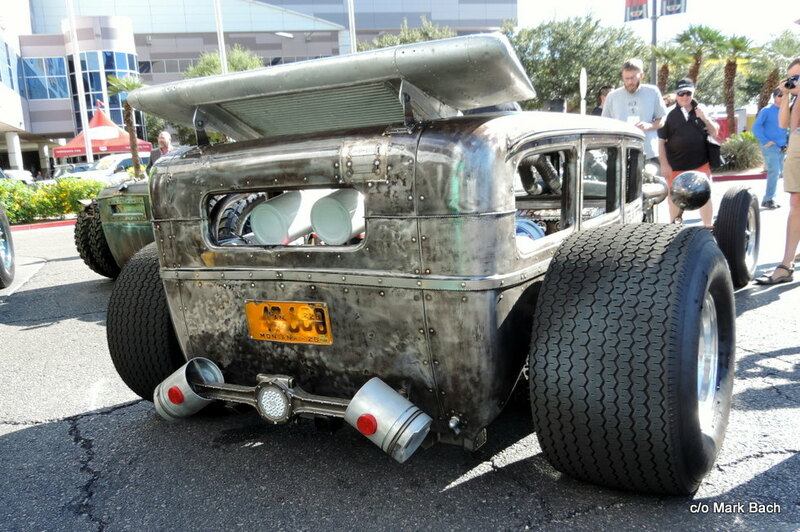 One builder opted to use pistons in a whole new way, as the car’s rear bumper! 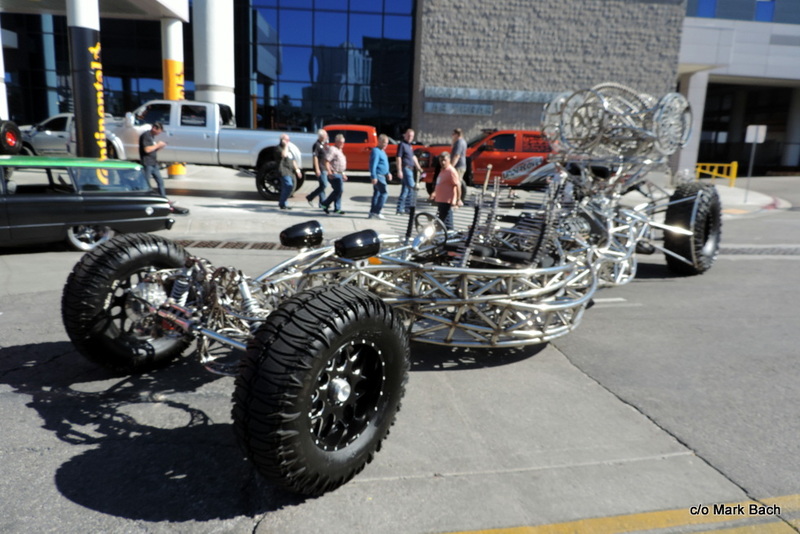 For the second year, SEMA had a Builder Build-Off competition. 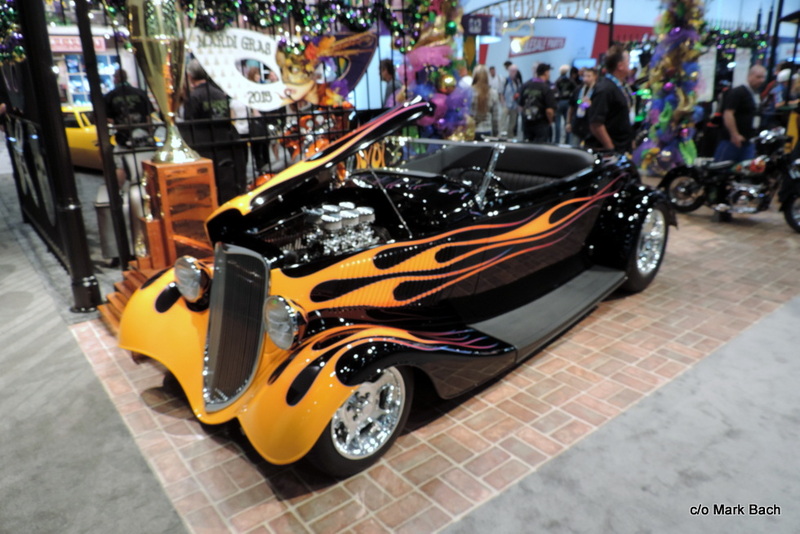 From a hundred cars and trucks, the field was finally narrowed down to three until Bobby Alloway won with his ‘33 Ford that had also won America’s Most Beautiful Roadster Award earlier this year in Pomona, CA. Personally, I was surprised that more “young bloods” didn’t get the recognition they richly deserved for their creations. Plenty of off-road and lifted trucks were to be seen at the displays. That helped to offset all the trucks slammed to the cement that were also parked nearby. Seems that the builders can give you any altitude you want for your attitude! 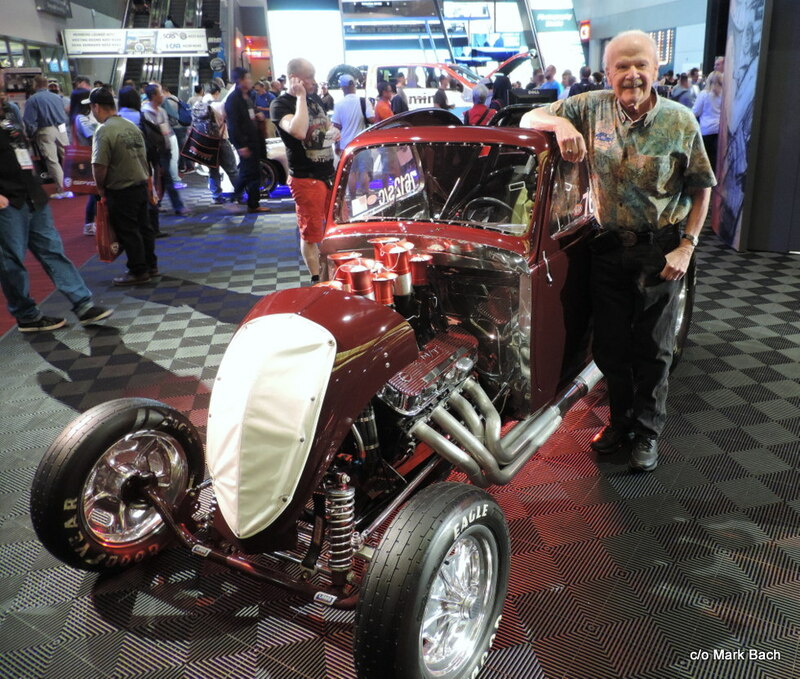 Regrettably, Dave McClelland (the former voice of NHRA) announced that this was his last year participating with SEMA as their host and announcer for the show. He had been there for all 49 shows, since 1967, and will be missed. SEMA is held in Las Vegas the first week of November but is restricted to the “trade only”, so the general public has limited access to this car fest. So enjoy these shots of the cars while you can.